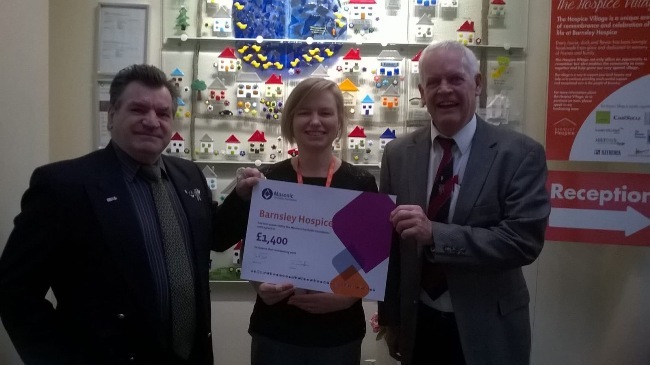 Barnsley Hospice has received a grant of £1400 from the Masonic Charitable Foundation, to help provide care for patients with life-limiting illnesses. This is just one of 245 grants to hospices around the country from Freemasons. In total £600,000 will be donated to hospices all over England and Wales this year. Contributions from Freemasons to hospices have exceeded £12 million in England and Wales since 1984 and are continuing to increase at a rate of £600,000 a year. Donations from the Barnsley community help the hospice raise the £2.2m it needs each year to care for patients and their families. A further £1.6m is provided by the NHS Clinical Commissioning Group (CCG).